Simon & Schuster/Paula Wiseman Books, 9781442426764, 80pp. In The Name Game!, Daphne has never (ever) loved her name, but it is her name and she can’t do much to change it. So when the first day of fourth grade comes, Daphne is flustered when the new teacher can’t seem to remember her name. It’s not Duffy or Daffy or Doffy. It’s Daphne! And if you ask her, there’s a lot in a name…. In The Vampire Dare!, Daphne wonders why everyone is so crazy for vampires. She decides it’s kinda cool to be bitten by a vampire because you’ll live forever—and if you can’t die, you can’t get old and wrinkly. So when the teachers announce a costume day (even though Halloween is long past), Daphne wants to be the best vampire ever! But what is cool and what is nerdy in Vampire Land? Daphne’s about to find out! 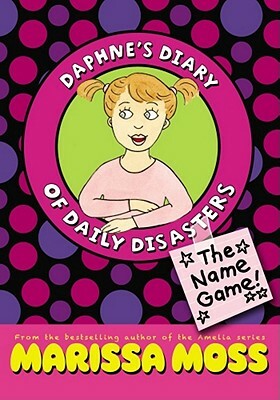 On her first day of fourth grade, Daphne starts a diary that quickly becomes one of doodles and disasters and sets up a new series by the creator of Amelia. In this series opener, her teacher, Ms. Underwood, mispronounces her name when calling the roll, so that classmates—except best friend Kaylee—are calling her Daffy. The very slim plot involves Daphne's discovery that the name game has happened to others. Her solution is to nickname her teacher, but she realizes that she’s not the first to call her teacher Mrs. Underwear. The first-person narrative includes familiar middle-grade scenes—a trip to the orthodontist and the boredom of watching her younger brothers’ soccer practice—sketches of people and things, even rebuses. In a companion story that publishes simultaneously, The Vampire Dare, her vampire costume turns out to be a disaster, prompting classmates to claim she has cooties. Again Daphne turns the tide by transferring the onus to a cootie-catching old doll. This light reading is made even lighter by the fact that the last quarter of each volume is taken up with extra material: lists and sketches of name disasters in the first and costume disasters in the second.